Long before diversity was even a concept, before the US was its own country, in 1665 to be exact, a Native American attended Harvard College. His name was Caleb Cheeshahteaumuck and a member of the Wampanoag Tribe in Martha’s Vineyard. 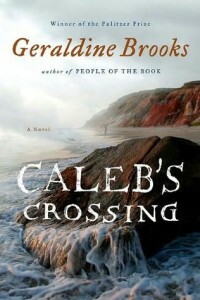 Unfortunately little is known about this young man who straddled two worlds, but Geraldine Brooks does a wonderful job of fictionalizing his life in her latest novel, Caleb’s Crossing. The story’s narrator is Bethia Mayhew, the daughter of a missionary and granddaughter of the island’s governor. Bethia meets Caleb by chance in the woods as a child, and their friendship blossoms over time. They teach each other their respective languages and compare religions, as Caleb shows Bethia the best places to gather berries and clams. Bethia’s life is full of chores, but she is smart and eager to learn like the men in her family. Thanks to Bethia’s help, Caleb learns how to read and speak English, preparing him to leave his tribe and study at Harvard. Although the story is about Caleb, Bethia’s plight as a woman in the colonies was a significant part of the novel. It was deeply disturbing that the concept of trying to educate Native Americans was far less shocking to the men in 1665 than the thought of teaching a woman Latin or Greek. Bethia is told over and over again that gaining an education will only lead her to frustration and that she should just accept her duties as a woman. Brooks wrote Caleb’s crossing with old English words and spellings and the strong Protestant beliefs of the colonists are featured throughout the story. Their faith, with their visions of Satan and temptation, come off as pagan as the many deities the Wampanoag worshipped. Brooks plunges the readers into the rigidly pious New England colonies in a thrilling novel that I could not put down. I would recommend this book for any book club as there are many themes to discuss including religion, the purpose of education, the coming together of different cultures, as well as the role of woman in the home. Caleb’s Crossing would be a wonderful title for a mother-daughter book club for children in middle and high school. Brooks brings history to life and touches on many hot topics that are sure to spark great discussions. I absolutely love your blog and find nearly all of your post’s to be just what I’m looking for. Do you offer guest writers to write content to suit your needs? I wouldn’t mind writing a post or elaborating on many of the subjects you write about here. Again, awesome website!